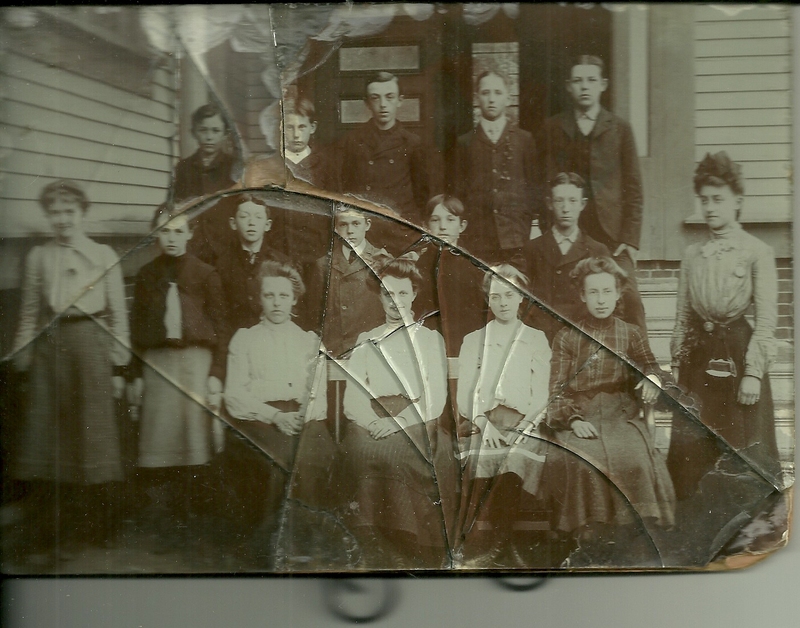 Photograph glued to glass (broken) with a stand affixed to it, of students at the Second Grammar School at Dexter, Maine, in 1903. Carroll M. Breed, born abt May 1890 in Maine, son of Susie; could he possibly be the Harvey C. Breed who married Zetta L. Phinney, also of Dexter, on 29 March 1911? Roy was, I think, William Leroy Springall, born about September 1889 in Maine, son of William and possibly Evangeline. He is possibly the William LeRoy Springall who indicated on his WWI draft enlistment card that he was born 30 September 1890, and I believe he's the William L. Springall who married Ruth W. Merrill on 26 November 1924. She had previously been married to Guy A. Bigelow. Grace Kelly or Grace Kelley, born about 1889 in Washington, D.C., daughter of Sarah (Sadie). She may be the Grace C. Kelly, who married Herbert E. Woodward on 17 November 1945. June Parsons, born about June 1889 in Maine, daughter of Forrest and possibly Rose Parsons. She may be the June Parsons who married Harry Young of Dexter on 25 June 1913. Mable Slater, born about Oct 1888 in Maine, daughter of George and possibly Emily Slater. In the Maine Marriage online database, there's a Mable F. Slater who married Harry W. Young on 23 August 1944. Could this be the same Harry W. Young who married June Parsons? Rosa Bailey, born about December 1887 in Maine, daughter of Edwin and possibly Carrie Bailey. I found a Rosie L. Bailey in the Maine Marriages database. She married Charles E. Pendexter on 10 February 1906 and Elbridge A. Flanders on 27 March 1907. Here's a map of Dexter, Maine, a scenic town of lakes, hill and farmland, located on Route 7 between Newport and Dover-Foxcroft. That's probably him then - thanks so much for taking the time to comment!